IS THE HISTORY OF THE GREAT DANE ENGLISH OR GERMAN? The history of Great Dane is not a one version story. Some would argue the breed evolved primarily in Britain over several hundred years, while others would say the Germans did all of the work. So the history of Great Dane depends on which version you listen to! Great Dane dog history first appears about 3000BC. We see Dane like dogs in carvings on Egyptian monuments built around this time. Fast forward 3400 years to the 5th century, when present day Europe was invaded by the Alanis, an Asiatic race, who brought giant mastiff dogs with them. Over the next several hundred years, it is surmized that these mastiff like dogs were cross bred with Irish Grey Hounds, producing a giant but slimmer breed than pure mastiff. It is also possible that these large mastiff dogs were brought to Europe by the Romans. Over several hundred years the Celts cross bred these giants with either grey hound or Irish wolf hound (or perhaps both). 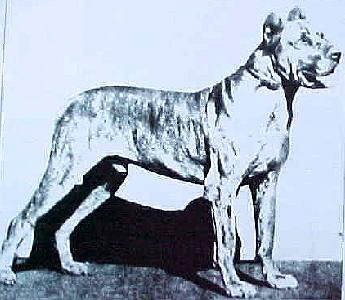 This effort led to the development of the "English Dogge", which some would say is the ancestor to the Modern Great Dane. It is probably true that both versions of Great Dane history are accurate and contributed to the beautiful animals we now enjoy, but certainly, the Germans deserve most of the credit for the development of the breed as we know it today. By the 16th century, these giant dogs were fairly common as boar hounds in both Britain and the Germanic states. 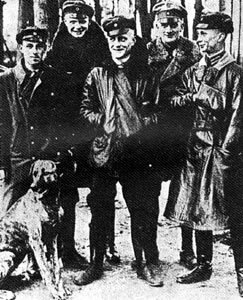 The Germans did import a large number of these "Englishe dogges" for cross breeding with their own version as they worked to develop the perfect boar hunter for their own needs. But here the history of the great dane takes another twist. Boar hounds were not cudly stoic dogs.European wild boar were very dangerous and hunting them required a fast, strong and aggressive dog. And that's what had been developed. But it was also realized, that a dog of this size could be an excellent guard dog - although in order to fulfill this function something would have to be done to make it more people friendly. And so over the 18th and 19th centuries, German dog breeders concentrated on evolving their boar hound into a breed of good temperment and friendliness. The Germans continued to document and develop the breed and in 1880 breeders and dog judges (dog shows and dogs were huge in Germany then as now) met and agreed that this German breed was now distinctly different from the English mastiffs and formally declared the "Deutsche doggen". In 1891, the Great Dane Club of Germany was formed (still called Deutsche doggen or German Dog club) and the modern day standard was adopted. Eight years later, the Great Dane club of America was founded in Chicago and the Dane was officially recognized in North America. So why is a dog breed that has never had anything to do with Denmark named a Great Dane? Another little twist in Great Dane history. In the early 1700's, a French naturalist, Compte de Buffon first saw these dogs while traveling in Denmark. 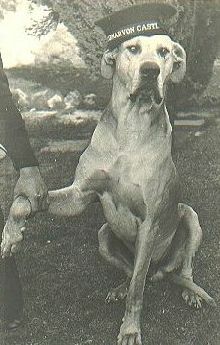 He labelled this breed "le Grande Denois" or Great Dane. For some reason, the name stuck - although only in English. (The Germans continued to refer to this breed as the "Deutsche doggen".) So, although Denmark has absolutely no part to play in the story of the history of Great Danes, the dog is nevertheless tied to it albeit in name only. Given the size of the Great Dane, many people seem to think the Great Danes war service is a rich history in of itself, but this is simply not true. There were large blood hounds used by both sides in the American civil war (there is some evidence these animals were probably a cross between a cuban mastiff and the Great Dane), but the truth is, despite their intimidating size, Great Danes don't make good soldiers. The army and the marines tried Great Danes during world war two but none of them passed basic training! On one notable occassion, an army drill sargent was moved to tears of frustration as he tried to train a Dane to jump over an obstacle. Instead of jumping as he was supposed to, the Dane kept running up to the obstacle, putting the entire thing in its mouth and proudly bringing it back to the trainer! But there have been some famous Danes associated with the military. One was even enrolled in the British Royal Navy! During World War II, the British naval garrison in Cape Town South Africa submitted all the necessary paperwork to enroll their mascot Great Dane into the Royal Navy. Listed as Christian name Bone and Surname Crusher, this Dane made himself comfortable in several different naval establishments in the area. He wasn't just good for local moral - he was also used extensively in the production of postcards that were used to raise funds for the war effort!He died in 1944 and recieved a quasi military funeral! And as a final note about the history of the Great Dane, there have been several famous Danes or Danes associated with famous people. The founder of modern day Germany, Otto von Bismarck always had Danes beside him. General Cornwallis brought his "english dogs" on campaign with him during the American war of Independance (he lost!). Buffalo Bill Cody always had his black Dane "Turk" with him and Manfred von Richtofen, the famous Red Baron,is said to have taken his Dane "Moritz" up for a couple of flights! 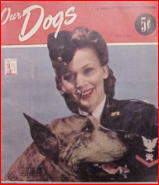 And of course, Franklin Delano Roosevelt was a Dane lover and always had several nearby. The entertainment industry has also made Great Danes famous. Brad Anderson's famous cartoon is centered around a Great Dane named Marmaduke - who hasn't seen that? Every babybooner and beyond grew up watching Scooby-Doo solve mysteries during Saturday morning cartoon hour! And in animated movies, Oliver and Company (1988) is centered around a Dane, as is the classic All Dogs Go to Heaven (1989). It seems that Great Danes history is colourful, interesting and is still being made!